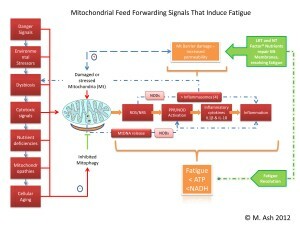 The functionality of the mitochondria is understood by many to be related to energy production and hence it is known as the cells energy factory. However, mitochondrial dysfunction has also been liked to a wide range of degenerative and metabolic diseases, as well as cancer and aging. These are all derived from the bio energetic role of the mitochondria which acts as the interface between the environment and the cell. Prof Nicolson has been studying the role of mitochondria in human health and the restoration and repair of the delicate membranes using natural agents for many years. Dr Ellithorpe has treated over 4,000 patients using glycophospholipids and published multiple research papers on the clinical application of the use of specific glycophospholipids and co factors. Their combined knowlege and experiences will assist you in comprehending the valuable role that the application of the agents can have in restoring mitochondrial function and capacity and the subsequent benefits for human health. This full day presentation will discuss the human trial undertaken to determine the resolution of fatigue and other benefits linked to restoration of mitochondrial membranes and cellulr respiration. 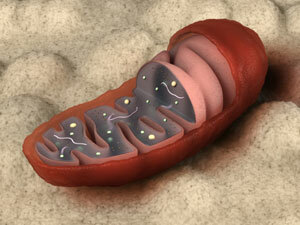 Mitochondria are found in every cell in the human body.1 Known as the “power plant of the cell,” mitochondria are central to the conversion of fatty acids and glucose to usable energy in the form of ATP (adenosine triphosphate). Back in 1972 a young researcher named Dr. Garth Nicolson and his colleague Dr Singer published a seminal article in the highly respected journal ‘Science’ which has since been referenced over 5,000 times by other scientific authors. The nexus of this work was that cells, and the organelles (including the mitochondria and peroxisome) within them, are surrounded by lipid-bilayer membranes that compartmentalise biochemical reactions and pathways. Membrane- embedded proteins then control the flux of molecules, energy, and information such that the segregated compartments function as a unified living cell. Converting complex science into clinical outcomes is sometimes referred to as ‘Bench to Bedside’ medicine, and this one day seminar will convey the complexity and beauty of the mitochondria, the conversion from lab science to humans, initially those experiencing fatigue from cancer treatments to chronic fatigue and then athletes and people with no organic illness but lacking energy. A safe and effective solution for the most common of allsymptoms – fatigue – its application extends to metabolic syndrome, diabetes, memory deficits, neurodegenerative illness and many other other conditions in which mitocohondrial insufficiency or damage is a component. To understand, review and apply strategies to meet the adverse production of reactive oxygen and nitrosative species derived from normal and abnormal mitochondrial output. To understand, review and utilise glycophospholipids in the restoration of ATP production and so reduce fatigue. To understand, review and apply the clinical intervention demonstrated in human studies and in clinical feedback to change and improve human function and recovery. Danger signals including those released as DAMPs can stimulate the overproduction of ROS. Danger signals including those released as DAMPs can stimulate the overproduction of ROS. ROS then promote mitochondrial permeability transition (MPT) that favours membrane leakiness, additional ROS and feed forward uncoupling. The activation of the PRR/NOD receptors and inflammasome stimulates additional mitochondrial DNA to be released. This further stimulates the inflammasomes and activating the innate immune system to respond more vigorously, including the release of proinflammatory IL-1β and IL-18. Mitophagy normally assists in the management of this process by removing ROS producing mitochondria, but DAMPs, environmental stressors, dysbiosis, cytotoxic signals, nutrient deficiencies, mitochondropathies, and cellular aging have all been associated with the suppression of mitophagy and the subsequent accumulation of damaged mitochondria. 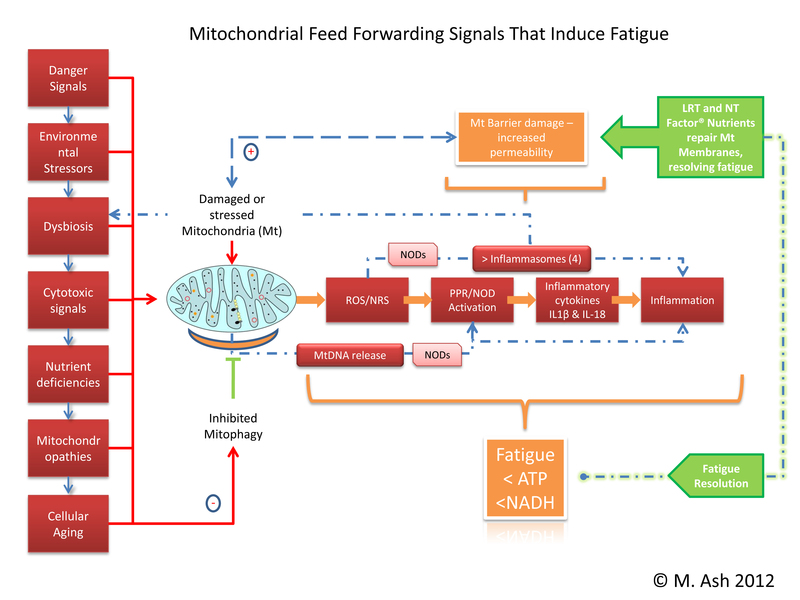 This model reflects how the activation of mitochondrial damage with altered membrane permeability leads to the production of inflammation that increases fatigue and related conditions. Credits for continuing professional development will be sought from relevant credit issuing bodies. A Nobel Prize nominee – Dr. Nicolson is the world’s leading authority on cellular medicine. He holds 9 U.S. patents and is the author of over 670 scientific and medical publications. Previous positions include Professor and Chairman, Dept. of Tumour Biology at the University of Texas M. D. Anderson Cancer Center, Professor of Internal Medicine and Professor of Pathology and Laboratory Medicine at the University of Texas Medical School at Houston and Professor of Comparative Pathology at Texas A & M University. Following his extenive work with the US marines and Seals in helping them identify a causitive agent for gulf war syndrome he is also:COLONEL (Honorary), U. S. Army Special Forces, 1995, SEAL (Honorary), U.S. Navy Special Forces, 1995. Amongst his many honors and awards he was the recipient of the Burroughs Wellcome Medal, Royal Society of Medicine Foundation, London, 1991. He is currently President, Chief Scientific Officer and Research Professor of Molecular Pathology, The Institute for Molecular Medicine in California. Dr. Ellithorpe received her medical degree in 1982 from The Chicago Medical School/University of Health Science in North Chicago, IL. From there she completed her internship in family practice at Womack Army Hospital, Fort Bragg, NC in 1983. At Fort Knox, KY, she served as an emergency room staff physician, general medical officer and flight surgeon as Chief of the Aviation Clinic from 1983-1990. Dr. Ellithorpe is a graduate and guest faculty member of Capitol University of Integrative Medicine, Washington, D.C. since January, 2001. There she taught anti-aging medicine and natural hormone replacement therapy for women and men. She is a Diplomat of the Board of Anti-Aging Medicine as well as the founder and medical director of Tustin Longevity Center. A national speaker on the topics of Oxidative Stress and Anti-Aging, she also has published her research in several peer reviewed journals. She participated in cancer investigations with Dr. Stanislaw Bruzynski at his research institute in Houston, Texas and was later published as a co-author in literature describing his unique therapy. A staff physician and Director of Women’s Studies at Whitaker Wellness Medical Clinic in Newport Beach, CA, she went on to help in the development of natural medicinal therapies at Great Smokies Medical Center in Asheville, North Carolina. Dr. Ellithorpe holds a second doctorate in integrative medicine focusing on health at the cellular level. With a determined commitment to her patients’ nutritional road to health, she regularly reviews modalities and documents results. This is done in an effort to share, through journal publications, research of successful interventions. Dr. Ellithorpe provides a practice rooted in a functional medicine approach which integrates the best of standard, western medicine with effective, natural therapies. Dr Ellithorpe is chief medical officer of Tustin Longevity Center, based in Orange County, California, – a medical clinic whose mission is to minister to each patient with TLC (tender loving care). After the success of our Refer-a-Colleague Scheme in other events, we have agreed to apply the Refer-A-Colleague Scheme to our upcoming Prof Garth Nicolson seminar: Glycophospholipids, on the 6th October 2012. We are thrilled to invite you to become a valued member of this scheme and also reward you for taking part. We all recognise how powerful word of mouth recommendations can be, and we appreciate your personal support. I am sure you know friends and colleagues that would like to take part in the Prof Garth Nicolson event, but have perhaps been put off by the costs involved, don’t want to lose a Saturday of free time, or they simply need a friendly nudge to get them on board! Nutri-Link’s Refer-A-Colleague scheme rewards both you and your colleague. A real Win-Win outcome. This offer is only available to those practitioners who are actually booked on to the current Prof Garth Nicolson seminar. Refer a colleague to the 2012 Prof Garth Nicolson seminar and you receive a £15 credit on future Nutri-Link Education programmes, or a £10 cash- back. Your recommended Colleague will receive a £10 cash discount, in addition to normal discounts, or a £15 credit on future Nutri-Link Education programmes. The colleague you refer must not already be booked on this Prof Garth Nicolson seminar. Retrospective referrals are not accepted. Your colleague’s attendance must be verified with full payment. Your colleague must mention you as a referrer when registering for the Prof Garth Nicolson seminar. Be sure to tell them to mention your name when they register! At the completion of the course, you will be given the opportunity to choose either the credit or the cash-back reward options. Credits expire October 31st, 2014. You and another colleague cannot refer each other. However, you can refer multiple colleagues and receive rewards for each person who qualifies, there really is no limit to the amount of colleagues you can refer and the credits you receive – so spread the word! Nicolson, G.L. Lipid replacement as an adjunct therapy in chronic fatigue, anti-aging and restoration of mitochondrial function. J. Am. Nutraceut. Assoc. 6(3): 22-28 (2003). Ellithorpe, R.R., Settineri, R. and Nicolson, G.L. Reduction of fatigue by use of a dietary supplement containing glycophospholipids. J. Am. Nutraceut. Assoc. 6(1): 23-28 (2003). Agadjanyan, M., Vasilevko, V., Ghochikyan, A., Berns, P., Kesslak, P., Settineri, R.A. and Nicolson, G.L. Nutritional supplement (NT Factor) restores mitochondrial function and reduces moderately severe fatigue in aged subjects. J. Chronic Fatigue Syndr. 11(3): 23-36 (2003). Nicolson, G.L. Lipid replacement/antioxidant therapy for anti-aging, fatigue and restoration of mitochondrial function. AgroFood High Tech 16(3): 20-23 (2004). Nicolson, G.L. Lipid Replacement/Antioxidant Therapy as an adjunct supplement to reduce the adverse effects of cancer therapy and restore mitochondrial function. Pathol. Oncol. Res. 11: 139-144 (2005). Nicolson, G.L. and Ellithrope, R. Lipid replacement and antioxidant nutritional therapy for restoring mitochondrial function and reducing fatigue in chronic fatigue syndrome and other fatiguing illnesses. J. Chronic Fatigue Syndr. 13(1): 57-68 (2006). Nicolson, G.L. Metabolic syndrome and mitochondrial function: molecular replacement and antioxidant supplements to prevent membrane oxidation and restore mitochondrial function. J. Cell. Biochem. 100: 1352-1369 (2007). Nicolson, G.L. Lipid replacement and antioxidant supplements to prevent membrane oxidation and restore mitochondrial function in metabolic syndrome and fatiguing illnesses. Townsend Lett. 286: 112-120 (2007). Conklin, K.A. and Nicolson, G.L. Molecular replacement in cancer therapy: reversing cancer metabolic and mitochondrial dysfunction, fatigue and the adverse effects of therapy. Curr. Cancer Therapy Rev. 4: 66-76 (2008). Nicolson, G.L. and Conklin, K.A. Reversing mitochondrial dysfunction, fatigue and the adverse effects of chemotherapy of metastatic disease by Molecular Replacement Therapy. Clin. Exp. Metastasis 25: 161-169 (2008). Nicolson, G.L. Lipid replacement therapy: a nutraceutical approach for reducing cancer-associated fatigue and the adverse effects of cancer therapy while restoring mitochondrial function. Cancer Metastasis Rev. 29(3): 543-552 (2010). Nicolson, G.L., Ellithorpe, R.R., Ayson-Mitchell, C., Jacques, B., and Settineri, R. Lipid Replacement Therapy with a glycophospholipid-antioxidant-vitamin formulation significantly reduces fatigue within one week. J. Am. Nutraceutical Assoc. 13(1): 10-14 (2010). Nicolson, G.L. and Settineri, R. Lipid Replacement Therapy: a functional food approach with new formulations for reducing cellular oxidative damage, cancer-associated fatigue and the adverse effects of cancer therapy. Funct. Food Health Dis. 4: 135-160 (2011). Nicolson, G.L. Lipid Replacement Therapy for restoring mitochondrial function and reducing cancer-associated fatigue and the adverse effects of cancer therapy. In Topics in Cancer Survivorship, vol. 2, ISBN 978-953-307-1361-6, InTech, Rijeka, in press (2011). Ellithorpe, R.A., Settineri, R., Mitchell, C.A., Jacques, B., Ellithorpe, E. and Nicolson, G.L. Lipid replacement therapy drink containing a glycophospholipid formulation rapidly and significantly reduces fatigue while improving energy and mental clarity. Funct. Food Health Dis. 8: 245-254 (2011).